At 6 weeks against parvovirus. At 8 weeks against leptospira, distemper, parvovirus, hepatitis, adenovirus, parainfluenza and coronavirus. Since it is not convenient to move the puppy immediately after vaccination, we postpone the delivery date at 10 weeks old. The rabies vaccine will be given at 3 months old to those puppies that must travel abroad. If not, the age we recommend for this vaccine is from 5 months old. - TREATED against internal parasites at 14 days, 28 days, 40 days and 54 days. - With EUROPEAN PASSPORT (official veterinary primer) in order. - Inscribed in the LOE. The corresponding "Certificate of Registration" will be given so that the new owners transfer the dog to their name definitively and with export pedigree in the case of puppies traveling abroad. - Signed document detailing the GUARANTEES for infectious diseases (10 days from delivery) and congenital (up to 1 year old). - SOCIALIZED and accustomed to dealing with children, other people, other animals and dogs of different ages and sizes, games, noises, car trips, etc. - With PUPPY PACK ROYAL CANIN containing 1 kg of feed for the first few days in their new home. - With NECKLACE and BELT for the trip and the first few days in your new home. In Gaspalleira we put special interest in the socialization of our puppies. During the first two months of the puppy's life, the foundations of his future character will be laid. In this stage they are like sponges that absorb all the stimuli and sensations of the world that surrounds them. 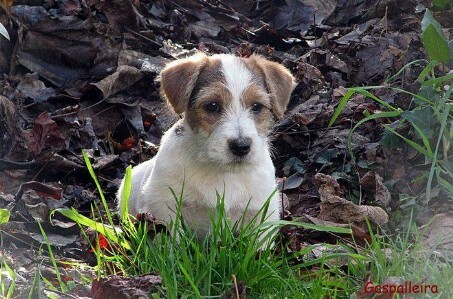 In these pictures you can see some Jack Russell Terrier puppies with 5 weeks of age. The discovery of new sensations, environments, noises, objects, etc. during his first weeks of life it is essential for the puppy to become a balanced dog tomorrow, without fear of strange situations. In a situation of fear, the dog can react with aggression, feeling that he is cornered. This type of aggressiveness appears without warning, and can result in a fight with another dog or even that someone is damaged. While I was taking these pictures, a stranger passed by the road in front of the house. The mastiffs began to bark suddenly. The little Jacks, hearing the loud barking of the mastiffs, became frightened, and ran to take refuge under me. At that moment I was crouched trying to find a better angle for the photos. This reaction I liked a lot. Faced with fear, they sought refuge in the human being. Our puppies know that the hand of man is the hand that feeds them, caresses them, cares for them, is a helping hand ... we try hard to get them to know it. Our puppies are born in our house, they are breeded with constant and specialized care. We spend a lot of time, energy and money. They are treated by several accredited veterinarians, throughout their growth. We deliver our puppies socialized and prepared to fit your new home. The price of our puppies is the price to have a puppy breeded in the best conditions, a rigorous selection of the best bloodlines, primacy tipicity, character and health. We maintain contact with their new families advising them and helping them with our experience and training in the doubts that arise to them throughout the life of your new companion. A puppy is a member of the family and will live with you for several years. In the "ABOUT US" section you can see our training. 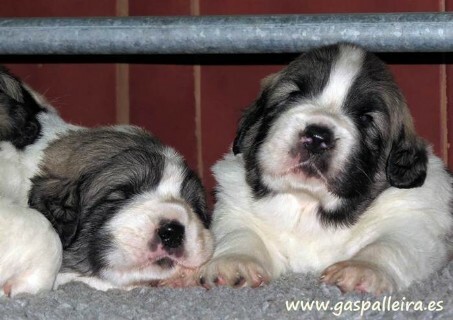 You can also find on our website the PYRENEAN MASTIFF STANDARD and the JACK RUSSELL TERRIER STANDARD, CARES OF PYRENEAN MASTIFF and CARES OF JACK RUSSELL TERRIER, and a brief information about the PYRENEAN MASTIFF CHARACTER and the JACK RUSSELL TERRIER CHARACTER.